As the Transportation Safety Board of Canada continues to investigate the fatal crash involving a train and city bus in Ottawa earlier this week, a somber coincidence has linked the train to another fatal collision two years ago. 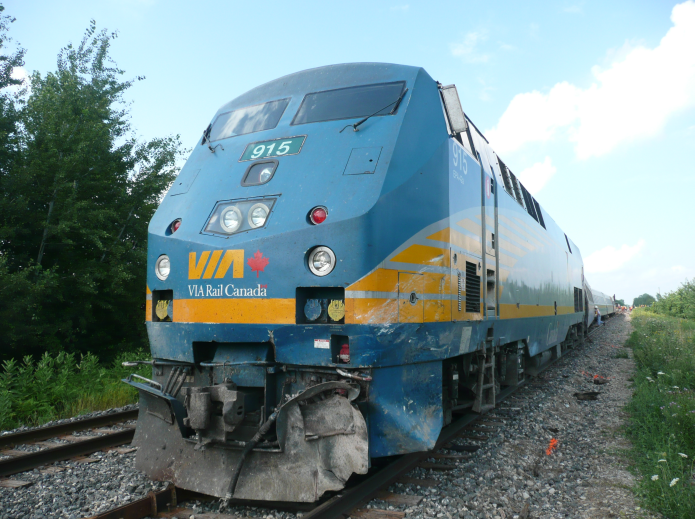 The locomotive pulling the passenger train toward Toronto on Wednesday appears to be the same locomotive that collided with a truck driven by 22-year-old John Jobson near Glencoe, Ont., on July 29, 2011. Images obtained as part of separate Transportation Safety Board investigations appear to be of the same vehicle. In each case, the locomotive is numbered 915, with the code EPA-42A included on its side. Other traits appear similar, including light placement and design. A website called Canadian Railway Observations, which tracks Via Rail's fleet, says locomotive No. 915 was previously damaged in a collision and repainted Renaissance green. A request for confirmation from Via Rail was not immediately returned. Six people were killed and as many as 30 others injured when a double-decker Ottawa commuter bus collided with the train early Wednesday morning. 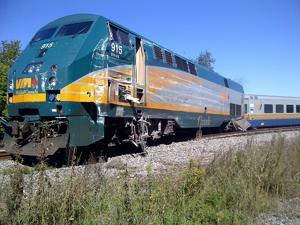 The locomotive itself was derailed in the collision, although no one on board the train was injured. 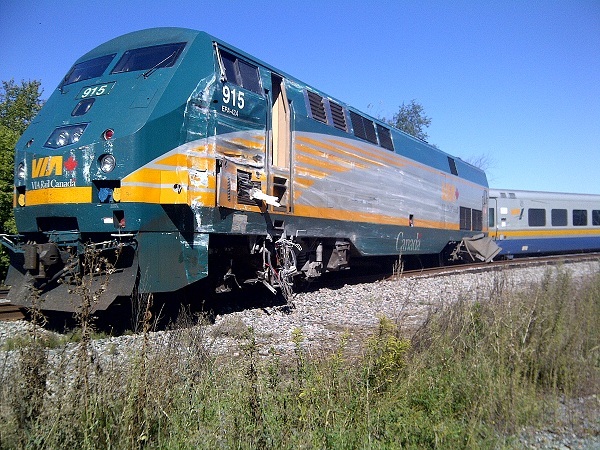 On July 29, 2011, a passenger train collided with a pickup truck at a rural crossing near Glencoe, Ont., the driver of the truck, was killed in the collision. The Transportation Safety Board determined that the train was operating "in accordance with regulatory and company procedures." Earlier this year, CN Rail, the track owner, filed a $500,000 lawsuit against Jobson's estate alleged the collision was caused by negligence in his driving. Via Rail current has 78 locomotives active on their network criss-crossing the 12,500 kilometres of track between the 450 communities it services. There is no suggestion that the appearance of the No. 915 locomotive is anything but coincidental, it is a stark reminder of the dangers associated with rail traffic. Cargo and passenger trains and like a speeding bullets shooting across the Canadian landscape. It often takes more than the length of two football fields for a train to stop, meaning they remain at the mercy of smaller vehicles to be aware of their presence. Freight train conductor Paul Proudlock told the Globe and Mail that train captains can feel helpless in the moments before an impending crash. He recalls a 2011 incident in which a woman laid down in front of his train and he couldn't stop in time. The Transportation Safety Board continues to investigate Wednesday's crash. 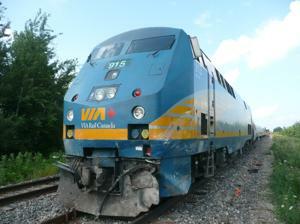 Meantime, train service has returned to schedule between Toronto and Ottawa.